When I was in high school, my parents shipped me away to one of those awful college prep summer programs. I’m sort of a dork so I didn’t really mind the classes but the cafeteria food was another thing altogether. Plain tofu was one of the only edible things besides jello and granola. I began to wonder whether I’d been shipped to a weight loss camp in disguise. So after a month or so of daily, unseasoned tofu I was pretty much ready to write it off for life. While I’m a huge fan of many vegan foods, I’m much more likely to use beans as the protein source. I sure didn’t expect to be posting any tofu recipes around here. 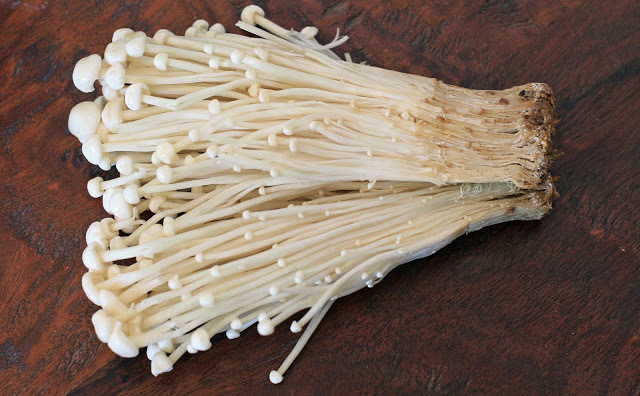 But then I found a store that carried packages of these cute-as-a-button enoki mushrooms for only 79 cents. And then I feel in love with this soy sesame dipping sauce. And finally, I saw a quick vegan recipe that combined the two. I figured the only things I had to lose were a 99 cent package of tofu and about five minutes of my time. Well, I think it’s safe to say that I’ve moved past my self-imposed tofu moratorium. 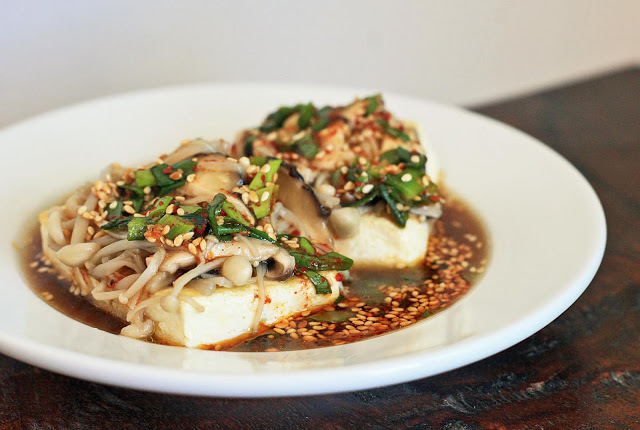 Quick pan fried pieces of tofu are smothered, and I mean that in the best possible way, with enoki and shiitake mushrooms and then drenched with that killer soy sesame sauce. This recipe might be just the thing to covert your tofu hating friends. Place the tofu in a microwave safe bowl and microwave for one minute. Drain the liquid. Cut the tofu in half so that the two pieces of tofu are half as thick as the initial block. Cut in half again, this time lengthwise. Heat 1 Tablespoon oil in a medium skillet over medium-high heat. Fry the tofu for about 2-3 minutes on each side, until lightly browned. Remove to two plates. Heat the remaining oil and add the mushrooms. 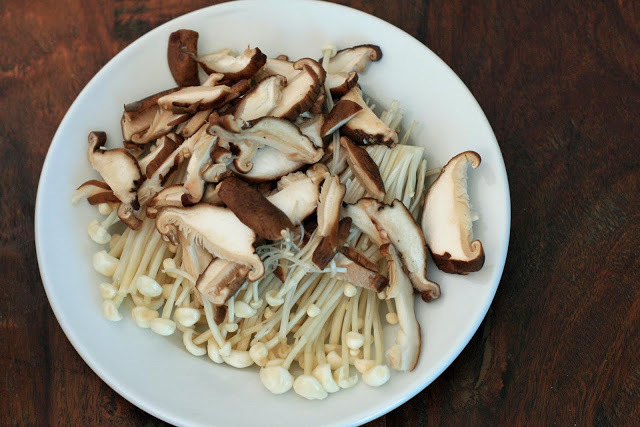 Stir fry for approximately 2 minutes until the mushrooms have softened. Spoon mushroom mixture over the tofu and drizzle the soy sesame dipping sauce over each piece.